Growing up Northern Maine I got my chances to build lots of snowmen. They weren't always perfect but I spent hours trying to build the biggest and best snowman that my short little arms would allow. I still live in Maine and I still make snowmen every winter. 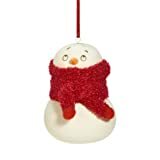 But now that I'm a big girl and married with my own Christmas tree (or two), I also love to put snowman Christmas ornaments on my tree, tuck them into my mantle Christmas decorations, and embellish the Christmas wreaths that find themselves on my front door, back door, and maybe an indoor wall. We live in a big farmhouse, so we have room for a couple of Christmas trees. I love to have different themes for each of them. In the dining room I have a very formal Christmas tree with crystal Waterford ornaments and white lights. But look out family room Christmas tree! This is where I get to go crazy. I love the look of white snowman ornaments against the deep green Christmas tree. I especially love the distinctive Old World charm of renowned ornament designer Christoper Radko. 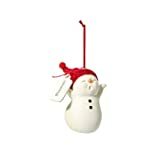 His snowman Christmas ornaments are the best! 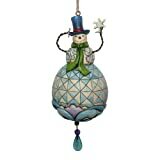 Jim Shore snowman Christmas ornaments evoke a primitive, folk art inspiration. If you have a country home or want to make any interior design style more warmhearted and folksy, then include a primitive country element. 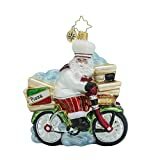 Jim Shore ornaments have much lower prices than Christopher Radko. 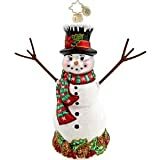 So if you're on a budget this year, his Xmas snowman ornaments are a beautiful choice. 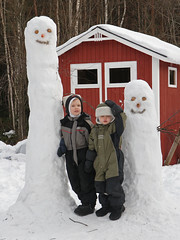 Remember those childhood friends that you used to make snowmen with? Well if you haven't seen them in a while, what say you send them a snowman ornament and rekindle that friendship. 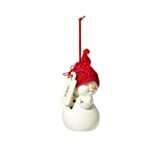 Check out the adorable Dept 56 Snowpinion ornaments below. They're a hoot. These little snowmen measure about 2 inches x 3 inches and have the best expressions. There's an entire series. In addition to the Fine, Whatever and Wound Tight, I've shown you. You'll also find exasperated pleadings like No Fair, Sweet, Believe, and Holiday Stress. Little boys who love their Legos grow up to be big boys who love their Legos. Honey I need help with the Christmas decorations, is a phrase that never makes my husband happy. But the year I bought half a dozen Lego ornaments and handed him the kits to put together, he was more than happy to do so. These are now HIS ornaments and he always makes sure that EVERYONE can see them. Of course there's a whole new generation of Lego lovers coming along. They'd love to find these in their Christmas stocking. 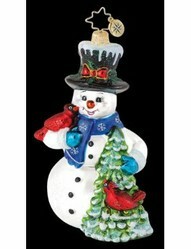 So hum a little Frosty the Snowman and put some snowman Christmas decorations in your holiday cheer. The Dept 56 snowmen are adorable! The snowmen in the picture at the top are really cute! I love the snowmen ornaments you have here.